Really teeny monsters who love to get into everything, and are small enough to do it. So teeny you can knit them up in less than two hours, so much fun you’ll want to make a whole army of them. Even smaller than the original Minions, these little guys are only about 8cm/3” long, and require only 2.5 g of yarn. 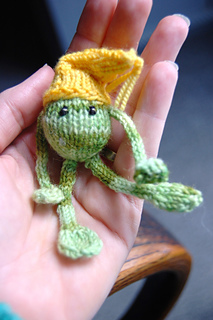 They are knit it in the round, so no seaming is required, but you will need to sew the arms/legs/hat on. This pattern includes four pages of instructions for knitting your Minor Minion. Additional technical support is also available through e-mail consultation.